Your own self-contained luxury accommodation with this tastefully furnished, spotless, modern three bedroom house. 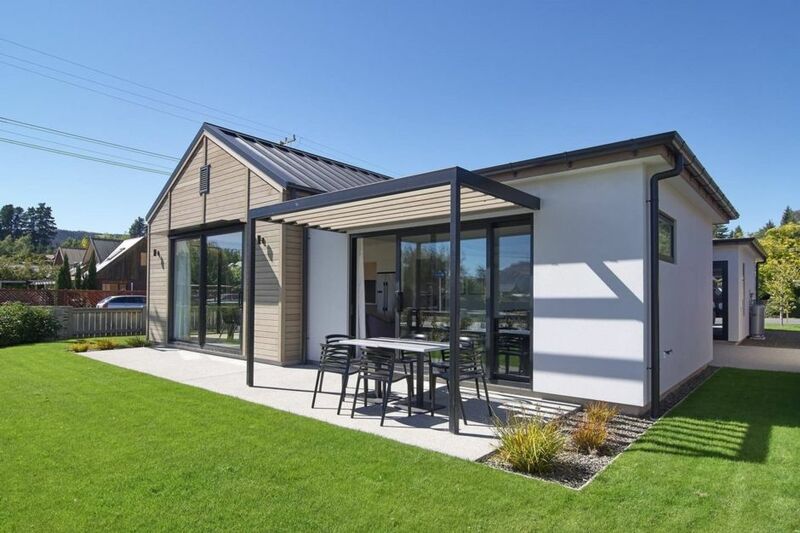 Although situated where Wanaka's old Primary School used to stand, there is nothing old about this house and just a short walk to the town centre and the lake front! The spacious open plan lounge with outstanding mountain views features modern decor, a large flat screen TV with Freeview, free high speed internet. Large double glazed doors open up from the both the living room and kitchen to a sunny outdoor barbeque/dining area. The kitchen is equipped with new quality appliances, crockery, cutlery and cookware. The master bedroom features a king bed and ensuite. The second bedroom has a queen bed and the third can be either two singles or a king. Each bedroom has a large shelved wardrobe. All beds are brand new and excellent quality. As well as the master ensuite there is a main bathroom with shower and bath. The gas fire and heat pump warm the house beautifully in winter so you will not feel the cold in this house. Ski storage and boot warmer provided. A touch of luxury for your Wanaka holiday! with 4 adults, we really appreciated having the living areas separate from the bedrooms. Beds were very comfortable, and enough linen. Great to have the kitchen so well equipped. Spacious and beautifully appointed made for the perfect relaxed family stay. Had everything we needed. My Partner and I were thrilled with the standard and position of this accommodation.